Why don't critics review the contribution of the audience as well as that of the performers? My question is prompted by our recent visit to the Edinburgh Festival. Let's forget about the ninety-minute queue of traffic caused by the unsigned closure of the main road into Edinburgh to construct a tramway. Let's forget about the trashy tourist shops and panhandlers on Princes Street. And let's forget about the two friendly policemen who advised us not to leave the car near the Festival Theatre in the city centre as "it would be stripped by junkies after dark". Let's instead focus on the people you can see in my header photo, the capacity audience for a performance of Sufi music and dance by the Istanbul Music and Sema Group. The performing style of the audience was certainly not minimalist, there wasn't an Arvo Pärt among them. These were big hitters, more like Edgard Varèse in fact. The coughing was loud and beautifully timed to peak in the quietest passages. Latecomers were happily admitted by the theatre staff adding a Bang on a Can element, while the 'walker-outers' started strutting their stuff ten minutes into the first half adding Xenakis like textures. There was even a multi-media contribution as the tourist couple next to us filmed the dances on their mobile phones in between talking. And the second half started to the kithara-like sound of tinkling glasses as the audience brought drinks in to the poorly-ventilated auditorium. Who are these people who pay big-bucks to attend the major festivals? The performance was sold-out months in advance. Did they buy tickets thinking they were seeing The Sound of Music instead of a sacred Sufi ceremony? Do the big hotels buy blocks of tickets and sell them at the last minute to unsuspecting guests? Even if they didn't 'get' the performance couldn't the big noises have the courtesy to keep quiet through the two short halves? The performance by the Istanbul Music and Sema Group was beautiful and moving. 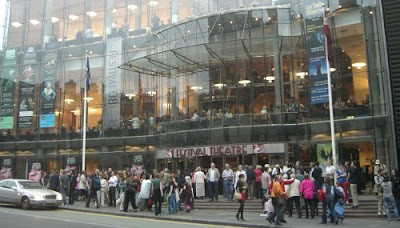 But my verdict is if you want to attend a virtuoso performance by the audience try the Edinburgh Festival Theatre. If it's Sufi music or dance you are after, forget it. More 'walker-outers' here, find out about the art of noise here, there's fighting here, and there's even a dog here. While I'm on the subject of audience noise whatever happened to the dreadful applause between movements at the BBC Proms? Yes i agree the behaviour of the audience was offensive, rude and made me ashamed to be an Edinburgher. But hey! No applause between movements.